Underfloor air distribution (UFAD) is a method of delivering space conditioning in offices and other commercial buildings that is increasingly being considered as a serious alternative to conventional ceiling-based air distribution systems because of the significant benefits that it can provide. This technology uses the open space (underfloor plenum) between the structural concrete slab and the underside of a raised access floor system to deliver conditioned air directly into the occupied zone of the building. Air can be delivered through a variety of supply outlets located at floor level (most common), or as part of the furniture and partitions. UFAD systems have several potential advantages over traditional overhead systems, including improved thermal comfort, improved indoor air quality, and reduced energy use. By combining a building's heating, ventilating, and air-conditioning (HVAC) system with all major power, voice, and data cabling into one easily accessible service plenum under the raised floor, significant improvements can be realized in terms of increased flexibility and reduced costs associated with reconfiguring building services. These raised floor systems are particularly appropriate for office buildings housing today's businesses with their typically extensive use of information technologies and high churn rates. Originally introduced in the 1950s in spaces having high heat loads (e.g., computer rooms, control centers, and laboratories), and subsequently introduced in office buildings in the 1970s, UFAD systems have achieved considerable acceptance in Europe, South Africa and Japan for more than a decade. However, growth in North America has been relatively slow up until the last few years. As with any new and unfamiliar technology, resistance to wider use is driven by the perceived higher risk to designers and building owners, a lack of available information in the form of standardized design guidelines, and in the case of underfloor air, the perceived higher first costs of raised flooring. In response to this need for more information, the Center for the Built Environment (CBE) developed this web site to provide a complete and unbiased description of underfloor air distribution and related technologies. For purposes of introducing the concept of an underfloor air distribution system, it is instructive to identify how these systems differ from conventional ceiling-based air distribution systems. Figures 1 and 2 show schematic diagrams of an overhead system and an UFAD system, respectively, for a cooling application in an open-plan office building. Some of the most important advantages of underfloor systems over ceiling-based systems occur for cooling conditions, which are required year-round in the vast majority of interior office space in many parts of the United States. Historically, the approach to HVAC design in commercial buildings has been to supply conditioned air through extensive duct networks to an array of diffusers spaced evenly in the ceiling. 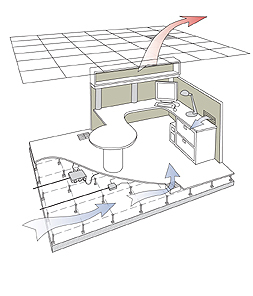 As shown in Figure 1, conditioned air is both supplied and returned at ceiling level. Ceiling plenums are typically quite large to accommodate the large supply ducts that must fit through them. Return air is most commonly configured as an un-ducted ceiling plenum return. Often referred to as mixing-type air distribution, conventional HVAC systems are designed to promote complete mixing of supply air with room air, thereby maintaining the entire volume of air in the space (floor-to-ceiling) at the desired setpoint temperature and ensuring that an adequate supply of fresh outside air is delivered to the building occupants. This control strategy provides no opportunity to accommodate different thermal preferences among the building occupants or to provide preferential ventilation in the occupied zone. With UFAD systems, conditioned air from the air handling unit (AHU) is ducted into the underfloor plenum where it typically flows freely to the supply outlets. Underfloor systems are generally configured to have a relatively large number of smaller supply outlets, many in close proximity to the building occupants, as compared to a conventional overhead system. Outlets may be floor diffusers, as shown in Figure 2, or, particularly when part of a task/ambient conditioning (TAC) system, desktop or partition outlets equipped with individual control. If the outlets are adjustable, this arrangement provides an opportunity for nearby occupants to have some amount of control over thermal comfort conditions in their local environment. Air is returned from the room at ceiling level (un-ducted plenum return is shown). This produces an overall floor-to-ceiling air flow pattern that takes advantage of the natural buoyancy produced by heat sources in the office and more efficiently removes heat loads and contaminants from the space, particularly for cooling applications. In contrast to the well-mixed room air conditions of the conventional overhead system, stratification is actually encouraged above head height where increased temperatures and higher levels of pollutants will not affect the occupants. in some arrangements the supply air is ducted through the underfloor plenum to the supply outlets, although in this last configuration certain energy and cost benefits may be reduced compared to the first two approaches. Improved thermal comfort. By allowing individual workers to have some amount of control over their local thermal environment, individual comfort preferences can be accommodated. Improved ventilation efficiency and indoor air quality. Some improvement in indoor air quality can be achieved by delivering the fresh supply air near the occupant at floor or desktop level, allowing an overall floor-to-ceiling air flow pattern to more efficiently remove contaminants from the occupied zone of the space. Reduced energy use. Energy use can be reduced through a variety of strategies including controlled thermal stratification, higher supply air temperatures, and reduced static pressures in the underfloor plenum. Reduced life cycle building costs. Raised access flooring provides maximum flexibility and significantly lower costs associated with reconfiguring building services. Reduced floor-to-floor height in new construction. UFAD systems can lead to reduced overall service plenum heights compared to conventional overhead systems. A single large overhead plenum to accommodate large supply ducts (Figure 1) can be replaced with a smaller ceiling plenum for air return combined with a lower height underfloor plenum for un-ducted air flow and other building services (Figure 2). Improved occupant satisfaction and productivity. Research evidence is mounting that occupant satisfaction and productivity can be increased by giving individuals greater control over their local environment. These advantages will be realized only if UFAD technology is appropriately designed and applied. In spite of the advantages of UFAD systems, there exist some barriers (both real and perceived) to widespread adoption of this technology. These are summarized below along with links to additional information on this website. New and unfamiliar technology. There has been until recently a lack of quantitative performance data and systematic design guidelines on this innovative technology. Perceived higher costs. The perceived higher cost of UFAD systems is one of the main reasons that UFAD technology is not used more widely by the industry today. There are several factors, however, that can make first costs very competitive with life cycle costs significantly lower than conventional overhead systems. Limited applicability to retrofit construction. The installation of UFAD systems and the advantages that they offer are most easily achieved in new construction. The feasibility of adding a raised floor may be restricted in the renovation of many buildings having limited floor-to-floor heights. Recent CBE research has found that low-height underfloor plenums (7 inches [0.18 m] and lower) can provide uniform air flow performance, which may improve the situation. Problems with applicable standards and codes. Since underfloor technology is relatively new to the building industry, its characteristics may require consideration of unfamiliar code requirements and, in fact, may be in conflict with the provisions of some existing standards and codes. Limited availability of UFAD products. Although the situation is beginning to change in recently years, in the U.S. there are only a few manufacturers offering UFAD products. Cold feet and draft discomfort. Underfloor systems are perceived by some to produce a cold floor, and because of the close proximity of supply outlets to the occupants, the increased possibility of excessive draft. These conditions are primarily indicative of a poorly designed or operated underfloor system. Problems with spillage and dirt entering underfloor plenum. Concern is sometimes expressed about the increased probability of spillage and dirt entering directly into the underfloor supply air stream, and therefore being more widely distributed throughout the occupied space. Tests have shown, however, that this is not the case. Condensation problems and dehumidification in UFAD systems. In humid climates, outside air must be properly dehumidified before delivering supply air to the underfloor plenum where condensation may occur on cool structural slab surfaces. While humidity control of this sort is not difficult, given the large surface area of the structural slab in the underfloor plenum, it is important that it be done correctly. Go to 'More Info' for a summary of ongoing research by CBE addressing UFAD technology needs; and 'Design Guidelines' for more information related to design, construction, and standards and codes. As awareness of the advantages of UFAD systems grows within the building industry, more of these installations will be completed in the coming years. As this occurs, it will be important to quantify the environmental and productivity benefits using underfloor technology. Building owners, developers, and other technology users need this kind of proof of performance cost-effectiveness (reduced life-cycle building costs) to overcome the barrier of higher first costs often associated with this and other intelligent building technologies. CBE will be monitoring selected UFAD projects and posting their observations on this website. 'Case Studies' presents six project profiles and one case study report, as well as a list of all UFAD building projects CBE is currently compiling information on. Efforts are now well underway in the following areas to provide more information and support to the building industry on UFAD systems. Design guidelines: In September 1999, CBE initiated a research project funded by ASHRAE and CBE to develop a design guide on UFAD and task/ambient conditioning (TAC) systems. The guide, entitled "Underfloor Air Distribution (UFAD) Design Guide," is complete (December 2003) and now available from ASHRAE. Standards: ASHRAE Standard 113-1990 (Method of Testing for Room Air Diffusion) is currently being revised to include a new standardized test and analysis method for evaluating the performance of UFAD and TAC systems. The recently revised and approved-for-release ASHRAE Standard 55-2004 (Thermal Environmental Conditions for Human Occupancy) will include some allowance for changes in the perception of thermal comfort when individuals are given some control over their local environmental conditions. Research: CBE and other institutions are involved in several ongoing research projects related to UFAD technologies, as previously mentioned and described in Current Research under 'More Info'. As this and other information becomes available, it is expected that greater acceptance and well-designed applications of this promising and innovative technology will occur.